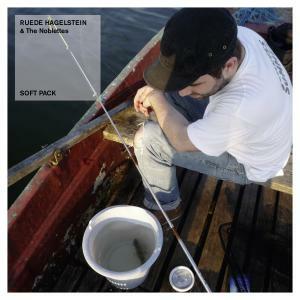 Ruede Hagelstein’s debut album ‘Soft Pack’ invites you into melancholic deceleration. Together with his band, The Noblettes, they create a timeless indie-electronica album on Tiefschwartz’s Souvenir Music. Their first album, ‘Soft Pack’ is reminicent of an early Simon & Garfunkel shaken and stirred with a modern twist. Laden with folk ballads such as ‘Berlin’, an ode their base, Ruede & the Noblette experiment with quirky jazz narratives such as the opening ‘A Priori’ and ‘Private’, and charm with spherical numbers ‘Posteriori’ and ‘Leaving The Center’, their pensive atmospherics are united by Ruede’s serene choirboy vocals. Flirting with intricate horns contributed by Mieke, piano solos and nomadic melodies amidst cascading layers of other worldly sounds, it’s a hard task to identify the band’s electronic roots as they fuse elements of psychedelia, ambient soul and pop. Ruede’s heart beats not only for the bass drum. A resident DJ at Berlin´s Watergate club, here he presents his down tempo side. Together with his buddy Justin Evans on bass guitar, vocals from Ruede and Aileen Phonix, Ruede’s childhood friend who also contributes keyboards to the live shows and Mieke Wenzl, who joined the band as a multi instrumentalist, they form The Noblettes. Ruede’s first releases inspired France´s electro-clash scene and landed on the Kitsune Maison compilation and were celebrated in England by the sleazy disco crowd, being licensed to Trevor Jackson’s Output Records. Producing since 2004, Ruede has always experimented with different genres and his music makes an arc that spans between the strobe and a candlelight, as in the track ´Emergency´, which stormed the polls in 2010 and is presented in a down tempo edit on the album. His productions have been licensed by the likes of Mathew Dear for his fabric compilation and Sven Vath for a Cocoon compilation and remixed by Chikinki and Louie Austen. He now calls Tiefschwarz´s Souvenir label his home and so it sees the release of his debut album, ‘Soft Pack’. Ruede is a child of Berlin, making it his home over a decade ago. He developed his early passion for music through writing as an editor of Flyer magazine, and later founding an underground website that gave him a unique insight into the surrounding night culture. Ruede grew up on the sounds of Jimi Hendrix and the Rolling Stones. In his youth, making music was reduced to the notes in choir, the holes in his flute and a permanently out-of-tune guitar. Like many others of his generation, it was his first computer that established his path to production, giving him a view through the sequence-window, a window that he still favours to look through upon a world of squares. He learned the fundamentals of audio engineering at the SAE-Institute and since has garnered skills that allow his music to infiltrate many worlds and take on various forms. ‘Soft Pack’ flutters with a sophistication and melancholy of a butterfly new to the world, brushing off its moth wings to break into rainbows of light and is an exquisite introduction to Ruede Hagelstein & The Noblettes. This entry was posted on October 4, 2011 at 11:58 am and is filed under News with tags Aileen Phonix, Electronic, EMN Promo, Indie-Electronica, Justin Evans, Kitsuné Maison, Press Release, Promo, Ruede Hagelstein, Soft Pack, Souvenir Music, SOUVENIRCD004, The Noblettes, Tiefschwartz. You can follow any responses to this entry through the RSS 2.0 feed. You can leave a response, or trackback from your own site.